Example, solutions, videos, worksheets, stories and songs to help Grade 8 students learn about perfect cubes and cube roots. In this lesson, we will learn what are perfect cubes and how to calculate the cube root of a perfect cube. What is a Perfect Cube? A perfect cube is a number that is the cube of an integer. Some examples of perfect cubes are 1, 8, 27, 64, 125, 216, 343, ..
What is a Cube Root? The opposite of cubing a number is finding the cube root. Since 53 = 125, the cube root of 125 is 5. The cube root of a perfect cube is an integer. It is possible to get the cube root of a negative number. For example, the cube root of −125 is −5. 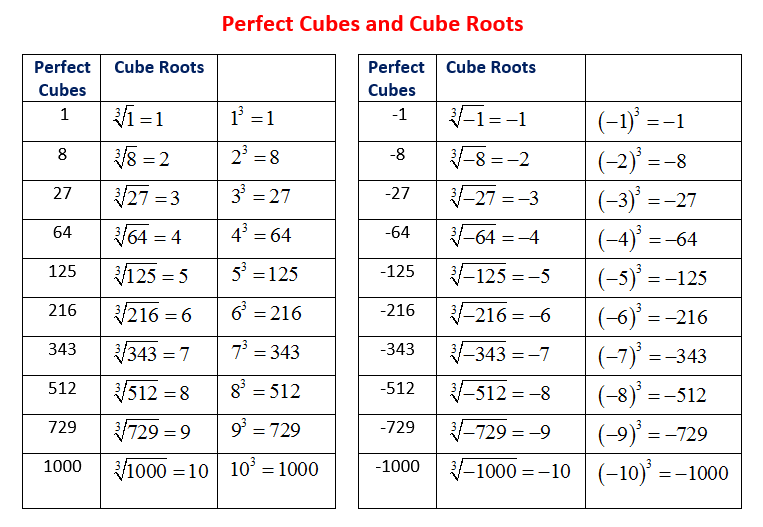 The following table shows some perfect cubes and cube roots. Scroll down the page for more examples of how to evaluate cube root of perfect cubes. How to simplify radicals with negative radicands and odd indexes? To cube a number, we use the number in a multiplication 3 times. A cube root goes the other direction. 3 cubed is 27, so the cube root of 27 is 3. The cube root of a number is the value that when cubed gives the original number. The cube root of 27 is 3 because when 3 is cubed you get 27. ∛ is the special symbol that means "cube root". It is the radical symbol √ with a little three to mean cube root. Perfect cubes are cubes of whole numbers. It is easy to work out the cube root of a perfect cube, but it is hard to work out other cube roots. How to find the smallest multiple of another number that is also a perfect cube? What is the smallest positive whole number that is a perfect cube and is a multiple of 24?